When I found out about the new kids’ book, Look Up! 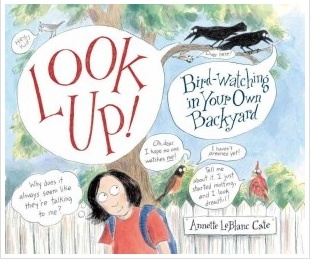 : Bird-Watching in Your Own Backyard by Annette LeBlanc Cate (Candlewick, March 2013), I thought it would be perfect for kids and especially for the Young Naturalists’ Corner at the Snow Goose Chase at the end of April. I was so lucky that Annette agreed with me, because she sent me not just three autographed copies of the book to give away to lucky winners, but also sent a copy just for me (I am planning a review as soon as I can). I can’t tell you what it would have meant to have this book when I was eight or nine years old — I’m sure I would have become a serious birder even sooner. Even before Annette and I became email friends last month, I thought it would be fun to interview her, and let more people learn about her and her wonderful new book. When you stop to think about, there really aren’t any good books for kids on learning how to watch, and listen to, birds. There are lots of junior field guides (such as Bill Thompson’s Young Birder’s Guide to Birds of North America, from Peterson), and story books about birds (such as The Burgess Bird Book for Children), and nature books about birds in the wild (such as Mel Boring’s Birds, Nests and Eggs), but really nothing to help kids, especially those who live in cities and might think there is nothing to watch, learn about the hobby of birding. Annette studied at the Art Institute of Boston and has written and illustrated two books, Look Up! and also the picture book The Magic Rabbit, new in paperback. She was also the art director for the animated television series, “Dr. Katz, Professional Therapist” on Comedy Central, which won Emmy and Peabody awards. Annette is also an illustrator for the Cobblestone Group of children’s magazine, including Appleseeds, Cobblestone, Cricket, and Spider. 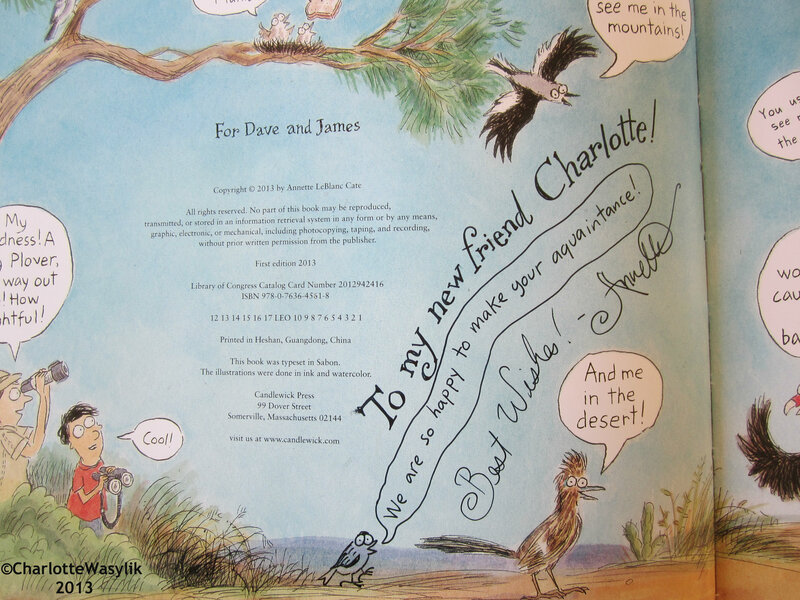 Annette lives, draws, writes, and birds in Massachusetts with her husband and two kids. Charlotte: When did you start watching birds? One day I was home sick, and I must have been really sick, because I’m never out sick! And when I was lying there on the couch, I heard a big ruckus on the roof. I crawled outside — the roof was covered with birds! What was going on? I had no idea what they were, or if they came everyday to cover my roof. Was this sort of thing happening every day? Clearly I was missing a lot in life. My house was being eaten by birds everyday, and I had no idea! So I made a pledge to myself to try and get out more and take walks at lunch — I thought it would be good for me, in the stress management department. Across the street from work was the Mount Auburn Cemetery, and that’s where I walked. It’s an amazing place, full of interesting trees and flowers, and it’s full of birds, too. (Famous for it, actually) The more I got outside and walked, the more I noticed birds. Really, had they been here all along, and I never noticed? I started thinking that there was all this wonderful stuff in nature going on, and I wasn’t paying the least bit of attention, and that bothered me. So I bought a beginners’ Peterson’s field guide and I looked up the birds eating my house, and they were Starlings. And then I saw another bird eating ants in my backyard, and i looked it up and it was a Flicker, and it was doing exactly what the book said it was supposed to do, which was eat ants, and I just thought that was so cool. Charlotte: Did you always like to draw? When did you start drawing birds? Annette: Oh yes! I always could. My brothers and sisters and I would always draw together. My mother would cut up brown paper bags for us to draw on, and then I think my father found a huge old blackboard at work and brought that home. We would draw on it just endlessly. I started drawing birds for real when I started watching them, for real. When I was working on the TV show and decided I needed to start walking outdoors, I decided too that I needed to start drawing other stuff besides the cartoon people in “Dr. Katz”. This realization came about when I had the wonderful good fortune to meet one of my comic idols, Stephen Wright — I had to draw him for the show. He asked me if I ever got up in the night to draw the characters. It hit me that no, I didn’t have to get up to draw them, I was already drawing them in my sleep, and that was when I could actually sleep, which was seldom. You can see I was a bit of a mess at this time in my life. So I decided that I needed to feel like I was some sort of artist again. I needed to get a sketchbook and some pencils and get out and draw stuff, stuff that had nothing to do with my job whatsoever. Again, I thought it would be good for me. So on the odd weekend day I had off, I started sitting in my yard and drawing, something, anything — the bushes, the trees, the skunk cabbage in the little swamp behind the house. There was a pond nearby with a spillway, and it was the first time I ever saw Swifts, and that became my favorite place to sit and draw. There were traintacks through the woods, my husband and I walked there alot (and there was a lovely pub at the end of that walk, always a selling point). The more I walked, the more I saw that I wanted to draw. The more I drew, the more I saw birds, and that, of course, led to drawing birds, since I was voraciously reading about them at this time, too. Charlotte: Do you have any hints for those who are learning to draw birds? Annette: Just keep at it. Be patient, practice as much as you can, and don’t worry how good or nice your drawings are. You aren’t trying to make a pretty picture, you are merely seeking to describe. Think first about the general shape. If you can see that, and get that down, it’s really half the battle. Don’t worry about details right off (though those certainly can be fun). Practice on birds that are easy to see, that will come quite close to you. Seagulls are absolutely the best! And don’t forget the birds’ environment, that’s important too, and if it’s too frustrating to draw a bird that’s flitting about, concentrate on something else for a while, like trees and leaves and all that. Any time spent outside really observing and drawing will help you. Charlotte: What made you decide to write/illustrate the children’s book, Look Up! : Bird-Watching in Your Own Backyard? Which came first for the book, the illustrations or the words? Annette: Well, I had been watching and sketching birds as much as i could, trying to identify them using my first beginners’ field guide.Then I got another, and another, and at first I was just picking through them, trying to match up the nice pictures with the birds I was seeing. But that was frustrating sometimes, because, as you well know, birds do not always look like their pictures in the books. And there were so many bird terms i didn’t understand, like “breeding plumage” and “semipalmated”. I would just skip over all that stuff, because I wasn’t really all that into it, right? I just wanted to know what a few birds were, I just wanted to “identify”, I didn’t have the time to read all that boring stuff in the beginning of the field guides. And then I would think I was getting somewhere, and then I would go to the beach and see all these brown seagulls and I would have no idea what kinds of seagulls they were, or I would see I bird I suspected was a warbler, but how could I tell, there were so many tiny little birds who all looked almost exactly alike, it was crazy! And I would be totally confused again. So one day I when I was going to visit my editor, Andrea Tompa, at Candlewick (I am very lucky, Candlewick is quite close to me, I can go in and visit whenever I want, they are the nicest people! ), I hauled along a big stack of my sketchbooks and loose sketches and drawings, and I handed this big armload of papers to her, and asked if she thought it could maybe be a book, and after shuffling through it thoughtfully, she said yes, she thought it could, and we worked on it together from there. So I would say, what came first, the illustrations or words? First it was organizing my cartoons (and since I have zero computer skills to speak of, there were many, many scraps of paper involved, and scissors, and glue sticks) into piles which eventually could be thought of as chapters. And then lots of thinking about what really was the focus of this book, what ages would this be for, how much information can you possibly stuff onto one page, how long can it be, mapping and reorganizing, and then much later the writing to link it all together. I’m a terrible writer, that was absolutely the hardest part, it was unimaginably hard! Although often it was also very fun — much of this book I wrote outside in my yard, watching birds, and my young sons at the same time. I really am quite indebted to Andrea, and the designer who worked on this book, Pam Consolazio. This book was a lot of work for them, too! Thank you, Annette! What wonderful stories! Just as a reminder, this is just Part 1 of my interview with author/illustrator Annette LeBlanc Cate. Stay tuned for Part 2 shortly! Nice post – good to see a kids book thats not just a advertisement for plastic toys!